Baked Potato Piroshki are simply the plural form of the Russian word pirozhok, meaning small pie. This recipe is a bunch of small meat pies, but adding everyones favourite carb, the potato. They are also sometimes called Pirozhki, or Pīrāgi, depending of what part of Eastern Europe you’re from. They were introduced by the USSR across the empire and are now commonly found across Central Asia. Around the world there are many variations of a meat pie, such as Empanadas, Samosas, Vatrushka, Belyashi, and even the Pasty are all similar. Although commonly fried in oil, which I think I prefer, to bake it is much healthier and absolutely delicious. I used to be scared of the work required to make dough with yeast, the rising, the temperature, but I love the dough setting on my Cuisinart bread maker. It does all the work for me, just drop the ingredients and walk away. It’s perfect! There are many variations of savory piroshki, and I think these Potato Piroshki recipe are one of my favourites. 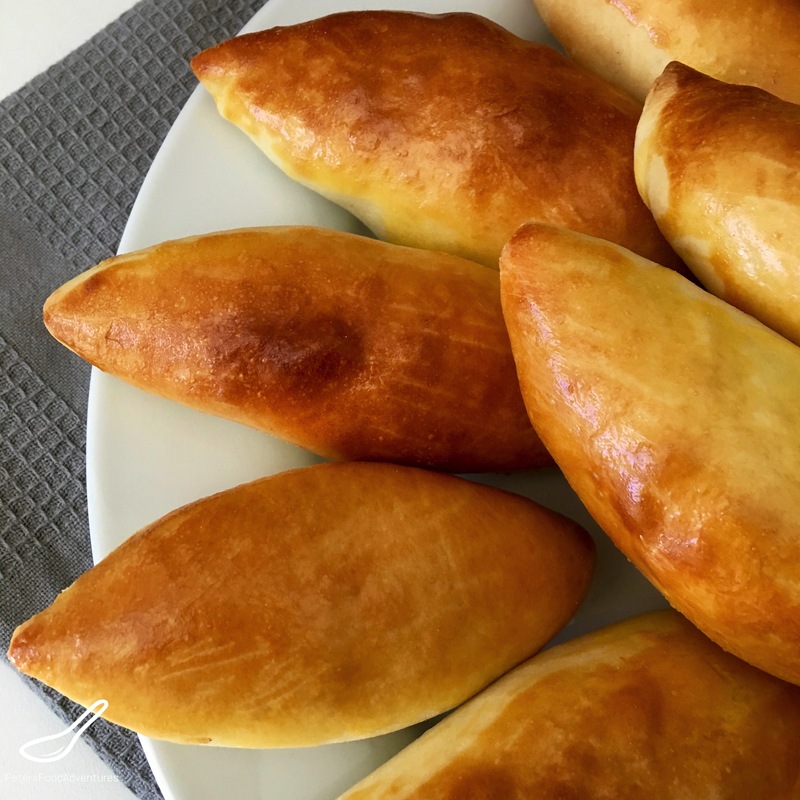 Check out my other Piroshki recipes on the site, including Fried Piroshki. I think everyone loves potato. Combining mashed potato with ground beef and onion is so simple and rustic, baked perfection. Some recipes only use potato and onion, some use cabbage Mixing the beef with potato makes it easier to work with, especially when trying to close the pirozhok, the mixture sticks together and doesn’t get in the way of your pinching. As kids we ate these with Heinz Ketchup, which isn’t traditional, but goes really well. Piroshki freeze really well, allowing the kids to pull them out for an after school snack, or honestly, an easy dinner sometimes along side with some borscht. I hadn’t made baked Potato Piroshki for a few years, and my son said, “Wow, I forgot how good these are!” So I’ll take the complement, from my kitchen to yours. Bon Appetit! Приятного аппетита! Place ingredients, in the order listed, into your bread machine and select the dough program. Milk, eggs, oil, flour, sugar, salt and yeast. Takes about 90 minutes for the dough cycle to complete. In a frying pan, over medium high heat, the ground beef until cooked and evenly browned. Add onions and continue to fry until translucent. Boil the peeled potatoes until soft, and make into mashed potato. Add salt and pepper to the meat and potato mixture, mix together and set aside to cool before adding to the dough. When the dough is ready, carefully place onto a lightly floured surface. Roll out the dough into a long sausage shape. You want to cut into pieces that are approx. the size of a golf ball. Or you can pinch off golf ball pieces from the dough. You should get about 24 pieces from this recipe. Cover pieces you aren't working on with cling wrap so they don't dry out. I worked on 4 piroshki at a time before rolling out more, allowing 12 per baking sheet. Roll out the dough balls thinly into the shape of an oval. Place about 1-2 tablespoons of the filling in the centre. Pinch both sides of the edges of the dough together, creating a seal all around. Don't allow the filling to touch the edges or the seal will come apart. Excellent recipe! Reminds me of my Baba’s, and they were pretty easy to make. Thanks for checking it out! ???? Good food should bring back good memories! ???? Hi how many pounds is 500 grams of beef, & 250 grams of potatoes? Also is it best to use Idaho russet potatoes? do u have directions for making dough without bread machine? 500 grams is about 1 pound. So 250g is half a pound. Idaho Russets are great to use. The same recipe without the bread machine should be similar. The portion sizes are changed to fit the machine. The chemistry of the dough is the same. Just find a warm place to allow to dough to rise ???? How can–may this old Carpathian-American, 4th generation, send you a respectable letter, perhaps a PDF? Thank you. The countdown has begun ; soon our great, Slavic, Feast of Feasts will be here. Time for me to get off my whatever and begin to make several kinds of kielbasa, check the horseradish, clean the pashka mold, etc. Uncertain times, but С нами Бог, Christmas OR Пасха. Thank you for “facilitating” old recipes without sacrificing flavors and traditions. Hi Mac, thanks for checking out my recipes. The best way to reach me would be via Contact under the menu on the website, and I can respond through there. ??? ?